Erosion is constantly changing the terroir of Burgundy, and in turn, it is altering the weight and character of the wines from virtually every vineyard on the Côte. How significant is erosion in Burgundy today? As mentioned in Part 4.1, a study during the late 1990’s measured the soil loss in unspecified vineyards of Vosne-Romanée to be 1 mm per year, and the same erosional levels were measured off of the vineyards of Aloxe-Corton. Ath that alarming rate, losses over the next century would have averaged 10 centimeters or almost 4 inches of topsoil if corrections were not taken. On the even steeper slopes of Monthelie, a study measured almost twice the erosion at 1.7 mm (± 0.5 mm year), with sections of the vineyard which measured a shocking eroded up to 8.2 mm (± 0.5 mm) erosional rate. Luckily, many growers have improved their farming practices, particularly since 2010, and these figures should be lower today. Only future studies can tell us what improvement has been made. For centuries the solution for this problem was to bring in soil from outside areas to replace what was lost on the slopes of the Côte d’Or. However, in the name of terroir, this is no longer allowed. 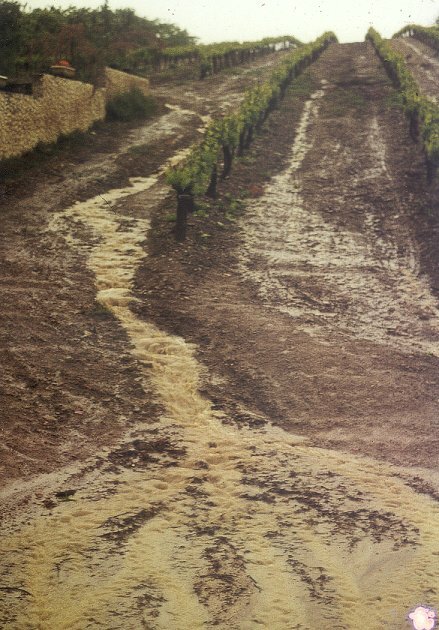 Current law allows growers to redistribute only the alluvium that comes to rest within appellation boundaries. One can imagine that the laborious process of shoveling out the alluvium from the toe of the plot and redistributing higher in the vineyard is a yearly chore. What earth escapes the appellation lines however, is gone to that appellation forever. The intention of preserving the purity Burgundy’s unique terroir by forbidding introduction of exogenous soils is somewhat paradoxical, since it is only attempting to preserve the terroir à la minute. While in reality it is ultimately is failing at that – due to erosion. A positive, unintended consequence of this inability to replace soil is that growers have finally realized that soil conservation is now more critical than any time in Burgundies’ 1500+ year-old viticultural history. They now know that they must fully understand the factors of soil structure and erosion, while at a municipal level, their villages must invest in effective storm water management; both of which are in various states of development or improvement. While the best modern practices are stemming the tide of erosion, vineyards still can be threatened. Even great vineyards on the mid-slope, like Les Folatières in Puligny-Montrachet, which have long, open stretches of vines without significant breaks in planting, are prone to extensive erosion. While soils are depleted not only in terms of depth, they are changing in terms of particle size and makeup. Erosion most easily targets fine earth fractions, detaching them from their aggregate groupings, and sending them into vineyards farther down slope. Light to medium runoff acts like a sieve, carrying away only the smallest particles, leaving behind material with of larger particles sizes. This in a very real way changes the vineyard’s terroir, and in turn, the wines that are grown there. 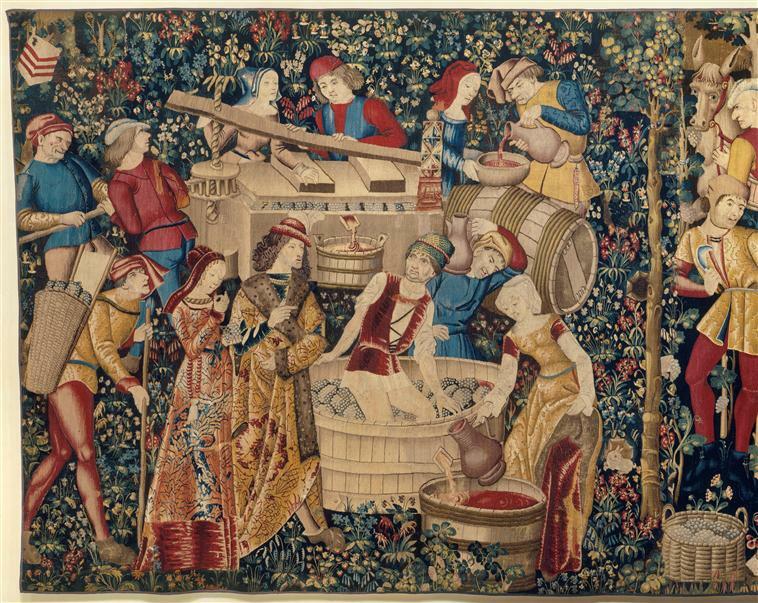 Wines from vineyards that retain only course soils of large particle size (1) tend to produce wines with less fruit the and less weight, and by consequence revealing a more structured, minerally character. Even more critical is that soil loss can threaten the vitality and health of the vines, as the soil is literally carried away from beneath them. A vine’s main framework roots is said to require a minimum 11-13 inches to anchor itself to the earth and survive. The problem arises when a section of vineyard does not have extensive fracturing, and the soil level begins to drop below that one foot level. To address this, various growers have responded by “reconditioning” their land. By using a back hoe to break up the limestone below, this can give new vines planted there the living space so the vineyard can continue. Does this change the terroir and the future wine more than inputs of exogenous soil? I should think the answer is yes, significantly. Rainfall is measured by its size and velocity. A raindrop from a drizzle is typically .5 mm in size, and has a terminal velocity (the maximum speed the drop can reach) of 2 meters per second, or 4.5 miles per hour, in still air. The speed it falls, with no assistance from the wind is determined by its ratio of mass to drag. 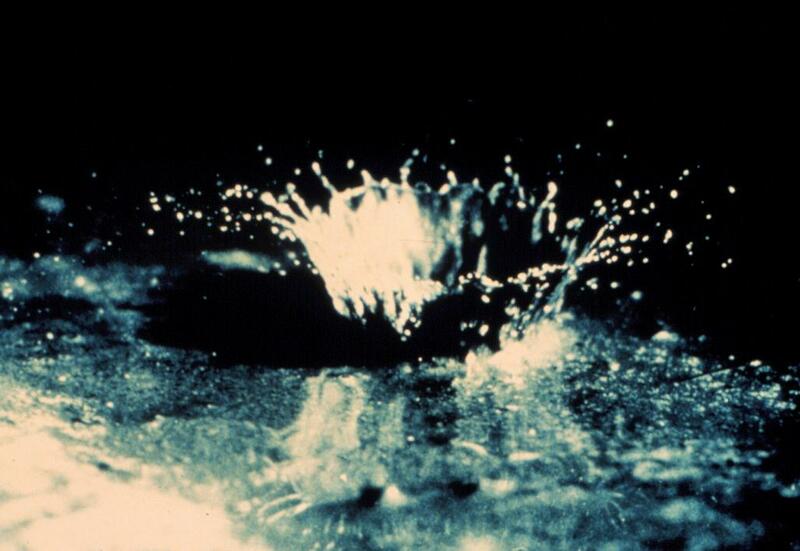 Large raindrops of 5 mm, have more mass in relationship to its drag and accelerate to 9 meters per second, or 20 mph. Rainfall, meaning the actual physical strike of each drop, can break down soil aggregates (fine sand, silt clay, and organic materials) and disperse them. Splash erosion has been recorded to drive particles of earth up to 60 cm into the air, and 1.5 m from its point of origin. Once their limited bonds are broken, the ensuing runoff can carry these materials downslope. Runoff, the most obvious form of erosion, occurs when rainwater cannot infiltrate the soil quickly enough, and exacerbated by the lack of cover crop, lack of organic material, lack of soil structure and negative effects of soil compaction. Of course, this process is most noticeable during high-intensity rainstorms, the amount of soil lost during longer but low-intensity rainfall can be significant. This slower erosion can go largely unnoticed until most of the productive topsoil has been removed by what is referred to as sheet erosion. 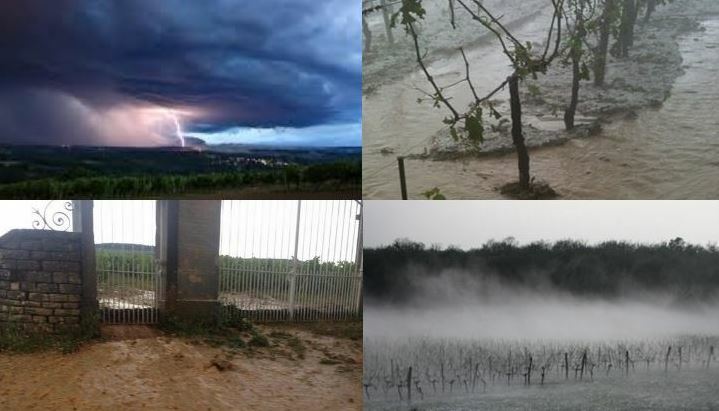 Compared to most growing regions, the Côte d’Or has a very wet growing season. Storms during this period can bring irregular and unpredictable rain events that can be heavy and long in duration. The winds during harvest tend to be westerly, with warm humid winds bringing rain first over the Hautes Côtes, then to the Côte d’Or, then out across the Saône Valley. The wet warm humid conditions often encourage powdery mildew in the wake of the storms, so there is a tendency to want to prune to open up the canopy for ventilation to prevent mildew. However, the vine canopy can provide significant protection against rainfall strike, depending of course, on the orientation the rows and the of the wind direction. So good canopy coverage for the period that half of the precipitation occurs (April – September)(2) is beneficial in terms of protection from erosion. As winter arrives, the vines will have lost their foliage, exposing the soil directly for the entire winter and spring to whatever nature has in store. Rainfall is typically measured in millimeters per hour, with a light rainfall slightly tipping the scales at up to 2.5 mm per hour or less than a tenth of an inch per hour. Moderate rainfall is considered to be from 2.5 mm per hour to 10 mm per hour. A heavy rainfall falls between the range of 10 to 50 mm, and a violent rainfall is above 50 mm per hour. Good soil structure is the result of the binding of soil into clumps of both small and larger aggregates, meaning sections of soil will bind more strongly together, than those next to them. This allows the soil to maintain the necessary small and large pore spacing, which allows water, air and nutrient infiltration and movement through the soil. Larger amounts of older, more stable organic matter tend to strengthen soil aggregates so any farming practice that increases organic matter, and the subsequent microbiological activity will result in healthier soils. Stable soil aggregates allow the soil to resist disintegration due rain strike and thusly helps deter erosion. It also encourages root penetration by creating weak spots between aggregate masses. Conversely, unstable soil aggregates are more easily dispersed by rainstrike, and the ensuing erosion clogs larger pore spaces of the surface soil. This clogging forming hard crusts on the surface which both restricts both air and water absorption and increases runoff. The fix apparently is simple. According to soilquality.org, soil forms aggregates readily with the addition of organic manure, as well as allowing cover crops to grow, which has the additional benefit of protecting the soil from rain strike and the ensuing erosion. The speed at which rain can be absorbed into the soil is referred to as infiltration rate. An infiltration rate of 50 mm per hour is considered ideal for farming, because even in heavy rainfall, a well-structured loam will not allow puddling. While the farmers of Burgundy do have some loam in their soils, the geological and topographical factors they face are far more and varied and thus more complex than that of the typical farming situation. I could find no studies done specific to infiltration rates of Burgundian soils, but below are the general rain infiltration rates of general soil types, starting with clay. The infiltration rate of clay soils, with good to average soil structure, unsurprisingly, do not drain all particularly well, due to their very small-sized particles. Clays typically have an IR of 10mm-20mm per hour. And as we know, transported clay, with its aligned particles, and plasticy quality greatly restricts water flow, and while it will absorb water, it will not allow water to pass through until the entire structure is saturated, greatly slowing drainage. Worse, due to poor farming practices, clay soils can have a decayed structure, which can slow absorption to less than 10 mm per hour. Water tends to puddle on clays with poor structure, causing them deteriorate to the point of deflocculation. The study of water and how it drains is researched acutely in areas where water is scare, whereas little study of drainage is done in France where rain and water are plentiful. Hence, my investigation of water infiltration in calcium-rich soils lead me to agricultural water policy studies conducted in Palestine and Spain. One such study found that Clayey Marl, with a plasticy character, had an infiltration rate of only 4-8 mm per hour. This low rate of infiltration suggests the soil structure had already been degraded through poor farming practices. Often the villain of low infiltration rates is a combination of frequent deep tillage, herbicide and pesticide use and compaction by walking on or working wet soils, which collapses weaken soil aggregates. In deeper soils, like at the base of the slope, collapsed soil aggregates can result in hardpan development below ground, while on sloped vineyards, disrupted soil aggregates are very susceptible to erosion. Clay-loam and clayey-marls, like those found on many lower-slope vineyards, that retain good soil structure, have IR rates beginning at 20 mm per hour. As the percentage of loam increases (equal parts sand, silt, and clay) the IR rate increases up to 50 mm per hour as long as it retains good aggregate stability and there is no compaction. Loam to sandy soils, which some Bourgogne-level and Village-level vineyards possess, can have very good infiltration rates, again as long as soil structures are good. Ideally, they can absorb 50 mm of rain per hour, which is the amount that a heavy rainstorm will produce. These vineyards, however, receive all the runoff from the slopes above, and their “well-drained” soils can be overwhelmed. Sandy soils and Calcareous (limestone) soils can have infiltration rates well in excess 150mm per hour to 200+mm per hour. The problem is these soils drain excessively well, and tend to not retain water well, and are prone to high evaporation rates. Off point, but quite interesting, are two studies in south-eastern Australia Bennetts et al. (2006) and Edwards & Webb (2006) found that rainwater remained relatively unchanged as it moved though these porous soils that lacked significant amounts of fine earth fractions and organic material. However, water changed its chemical signature quite significantly as it passed much more slowly through clay-rich soils. This finding certainly challenges the long-held assumption that it is the limestone lends many Burgundies their mineral character. Infiltration Rate, Slope, and Runoff. A study in Spain by A. Cerdà (Univ. de València) examined infiltration rates, runoff, and erosion, on clay, marl, limestone and sandstone. Additionally, he ran these trials with three levels of vegetation covering the soil material: bare, intermediate and vegetated. The amount of water delivered was 55 mm per hour (which some soils easily absorbed). The study showed slower rates of infiltration on the bare soils, while more highly vegetated soils reduced and almost eliminated runoff and erosion. Interestingly, marl soils fare the worst for both runoff and erosion rates on bare soils. Yet on vegetated soils, runoff and erosion of the marl were minimal. They observed, of bare soils, an infiltration rate of 3 to 55 mm per hour, the runoff from 0 to 83%, and the erosion rates from 0 to 3720 grams per hour. The easily erodible marl soils had up to 83% runoff and a maximum erosion of 3720 grams per hour. So it turns out that marl soils are particularly vulnerable to erosion which sets up an interesting dichotomy: Burgundian’s penchant for discouraging ground cover between the vines, actually encourages erosion – something they seek to, and direly need to avoid. Clay (soil) and limestone (soil) both had what Cerdà considered to be intermediate levels of runoff and erosion; with a maximum of 46% runoff, and a maximum of 131 grams of soil material eroded per hour. When we talk about erosion, we are implying there is a slope. On the rockier terrain of upper slopes, the uneven the soil surface can slow the momentum of water coming down the hillside, despite the steeper grade. However, as the runoff moves downslope, and the soil becomes smoother, the water grows in volume as in joins other rainfall which has not yet infiltrated the topsoil. This increase in volume causes the runoff to increase in its speed and its velocity. Speed and velocity increases are exponential, as its mass allows it overcomes the friction of moving over the soil below. Despite the fact that these moderate slopes can attain fairly significant soil depth with normal, moderate rainfall, they are also prone to erosion when exposed to heavier storm-induced runoff. Any long, uninterrupted stretch across these moderate slopes encourages a fast, and often damaging, runoff. As the speed of the water increases, it achieves a volume sufficient to carry larger and larger particles. Cerdà’s study suggests that the marl that has developed on these slopes are particularly vulnerable to heavy runoff if no vegetative cover is allowed to grow among the rows. The ratio of surface area to weight determines a soil particle or rock’s suspension velocity. This is the amount of water velocity needed to carry the object in its flow. 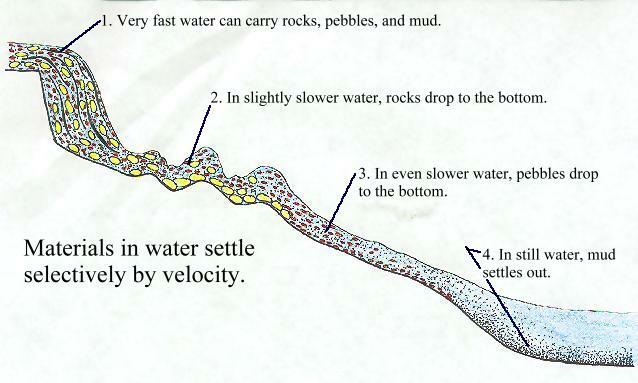 As the flow decreases, rocks with higher suspension velocity, meaning they require fast-moving water to carry them, settle out quickly, and are said to have a low settling velocity. As the water slows, it is these, the densest objects, that fall out of suspension first. Silt and Clay particles have a very low suspension velocity due to their extremely small size, regardless of their density. These particles are easily picked up and washed away by water movement. Unless the clay particles in suspension are adsorbed as it slowly passes a homogeneous clay body (ie. a kaolinite clay body attracts kaolinite clay particles and illite particles will flocculate with an illite body), clay particles will not settle out of solution until the water becomes still and ponds. The same is true with silt, with its slightly larger particle size. Sand and gravel are larger, with enough density to resist slow-moving water. They are considered to have a higher suspension velocity than silt or clay. But neither sand, gravel, nor even rocks the size of the palm of your hand, are immune from alluvial transport. 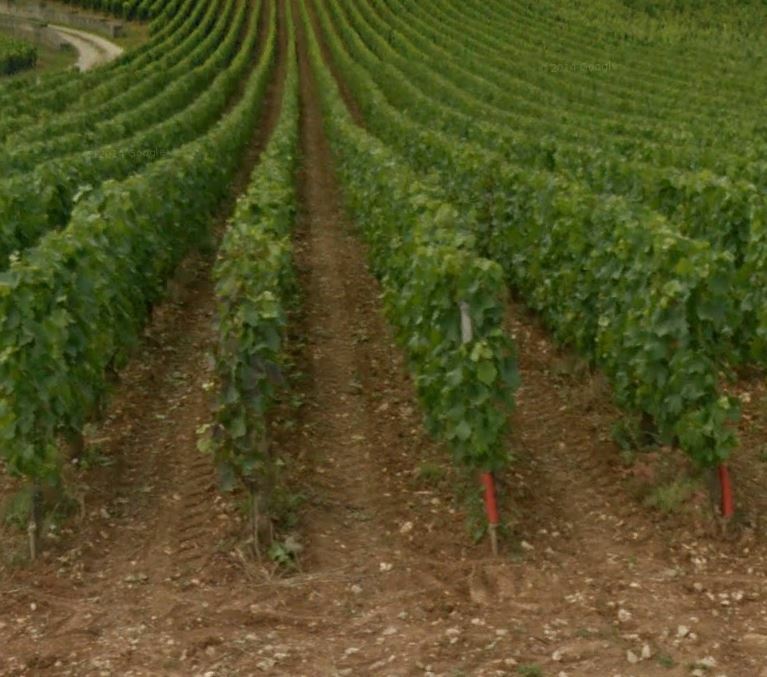 (1) It could be argued that because of Burgundy’s monoculture and high erosion rates will only allow calcisol, and because of that soil development (pedogenesis) is not possible due to the filtering out of fine particles, both mineral, and organic, by erosional processes. Conservation tilling or zero till could greatly change that dynamic, and it is possible with these and other techniques, that growers could expose the truer terroir of Burgundy. (3) Could this chemical signature change the flavor of wine? This certainly raises a whole host of questions regarding the impact of fast draining limestone on the flavor or minerality of in wine. This study would suggest the long-held belief by many that limestone gives wines a minerally characteristic is false.